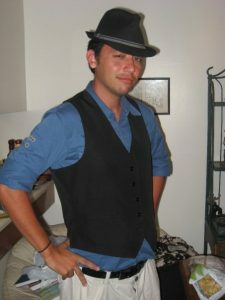 It’s June 2008 and I’m a college student. The semester is coming to a close and to celebrate the occasion I decide to throw a party with all of my closest friends. But what kind of party? At that time (and currently) I was enamored with the concepts and aesthetic of Steampunk. 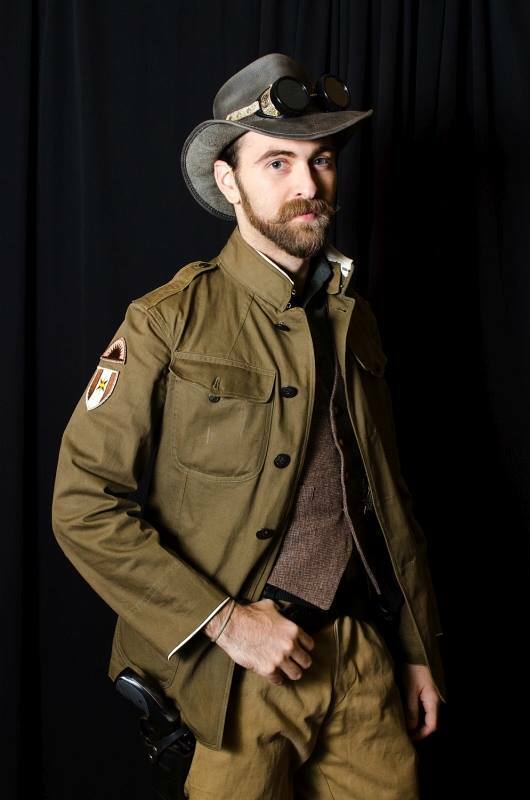 I was fascinated by the costumes and the alternate history of a world powered by steam, where airships covered the skies and adventure awaited at the margins of Jules Vernes’ imagination. 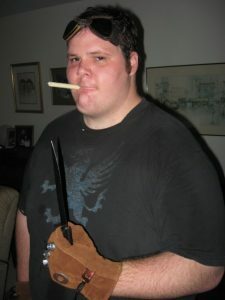 I planned a party, invited my best friends and planned to indulge in some finger food and play some steampunky games. A full month before the party I created a Facebook group to organize the proceedings and, more importantly, make a steampunk based group. (Groups were all the rage on Facebook back in 2008.) Finally, after a month of dreaming of Springheeled Jacks and steam powered monowheels, the day of the party arrived. Unfortunately, no one could make it that day so we moved it back. Then we had finals so we had to reschedule and finally, on June 14th 2008, we were all able to meet and have our steampunk party. And with no pomp or circumstance, we become the first people to enjoy International Steampunk Day. It was very low key and we watched Firefly because we couldn’t find a suitable steampunk film. I still lament that we didn’t have a copy of Studio Ghibli’s Castle in the Sky. But, that was all. That was the unceremonious beginning of International Steampunk Day. The following year, in 2009, a year and over 200 followers later, I decided I wanted to go bigger than than year before. It was a low bar but I was determined to steamjack my way over it. As the date come steadily closer I took it upon myself to buy my own pair of goggles, paint them brass and find then myself an appropriate costume. 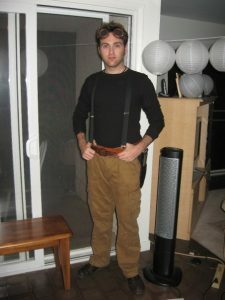 I made do with suspenders and some khaki cargo pants. When the night finally arrived we all gathered at my friend Jon’s home and dubbed ourselves, The Crew of the Brass Moth. We drank strawberry lemonade and played board games. 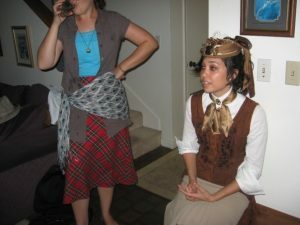 This June 14th, will mark the 10th year Anniversary of International Steampunk Day and I honestly never imagined when I asked if we could have a Steampunk Party at my friend’s house, that it would ever become an actual International Day of Steampunk recognition. In some ways, this is how I feel all truly good things begin. They begin as something benign, supported by like minded individuals who share an interest and become friends. That interest and friendship inspires more people until you have something that matters to people. I feel that International Steampunk Day is no different. I’m personally astounded at the response that this day has garnered. I remember several years into our celebrations of it, I was on the internet and found a German website offering a sale in celebration of International Steampunk Day. I was shocked! Something had shifted. This was no longer a minor holiday but something that people everywhere were actively enjoying! Today, International Steampunk Day is celebrated around the world, (although true love of steampunk is a year round affair). Googling images shows people in handmade costumes, YouTube videos in Spanish talking about what the day means to them, blog posts on how people celebrate and lists of gatherings and meet ups. It’s incredible. In my opinion, I feel that International Steampunk Day has become so successful due to its International tagline. Steampunk is not only about British Victorians but about all people everywhere. It’s an aesthetic that transcends borders and nations. Every culture and creed fits into its alternate history, often times imagining a world that was better than the one history gave us. We all deserve to be the hero of our stories, no matter where we come from, what we look like, how we feel or what we believe in. Steampunk is one framework that allows that to happen. I personally hope that International Steampunk Day will continue on for many more years. Even now, as the cutting edge popularity of steampunk begins to wane, my most earnest wish is that the holiday will still see even more people gather to celebrate it. I hope we all take a moment on June 14th and revel in some fun escapism and see a world through fresh eyes with people we care about. For to me that is the true spirit of International Steampunk Day. At its core it is about friends and having a good time with something we unabashedly loved, just like on that first evening in 2008. So, thank you Jon, Brandon, Mari, Mark, Caroline, Carolyn, and Erika for a great party. Here’s to the many that came after it, and to the many more to come. May you have a smashing good International Steampunk Day on June 14th 2018!